Take your style and appeal to the upper echelon with the House of Escada. 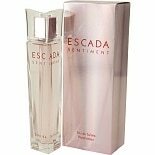 Known for intricate packaging and high-quality product design, Escada has achieved commercial and critical acclaim with its line of fragrances, with standouts such as escada magnetism. The scent features a diverse, feminine blend of vanilla, pineapple and watermelon, with notes of lilies, ivy and mint, and a smidgen of musk and patchouli. Escada Signature is another dynamic scent that gives you an air of elegance. It features a flowery, fruity blend of black currant, orange blossom, lemon, bergamot, cucumber and vanilla, with green leaves, magnolia, jasmine, rose and peony. With a designer fragrance, you are acquiring a product that is made with not only the finest ingredients, but with some of the most prized expertise the industry has to offer. When compared to a conventional perfume spray, the designer scent is typically blended and balanced in a superior manner. They are also longer-lasting and many times suitable for multiple uses.